Are you looking for a top-performing mobile device? 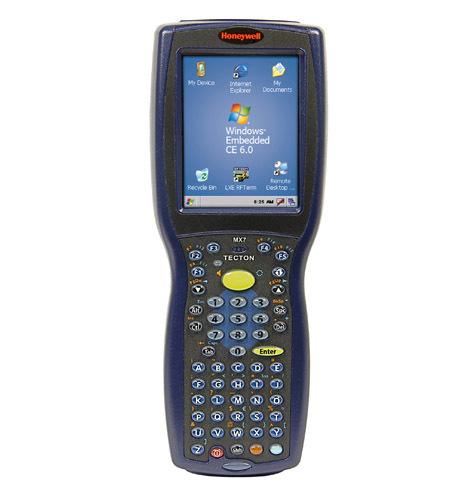 The Honeywell Tecton is a robust handheld terminal which will even impress demanding users with its performance. Nestled in its highly robust IP65-certified plastic housing resides the fast 806 MHz processor. To achieve the maximum in longevity and robustness, the electronic parts were soldered and glued to the motherboard. This effectively protects it against drops and prevents long downtimes. An epoxy-topped keyboard (with either 55 or 32 keys) protects it against wear, as well as airborne and spilled chemicals. Thanks to its large touch display (screen size: 8.9 cm/3.5”), multiple scanning options (1D, auto-range, 2D), optional 802.11 a/b/g Wi-Fi connectivity, powerful battery, ergonomic design and the SD memory card slot, the Tecton fulfils all typical daily requirements. The special version for usage in cold storage, the Tecton CS, comes with a heated display which you can also easily operate with gloves. Thus, this terminal also ensures for smooth operation even in extreme temperatures of up to -30 °C.